For courses in International Finance. 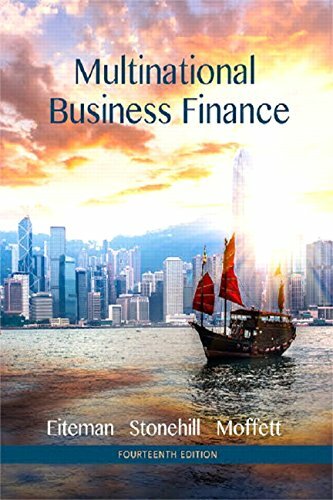 Renowned for its authoritative, comprehensive coverage of contemporary international finance, Multinational Business Finance trains the leaders of tomorrow’s multinational enterprises to recognize and capitalize on the unique characteristics of global markets. Because the job of a manager is to make financial decisions that increase firm value, the authors have embedded real-world mini-cases throughout to apply chapter concepts to the types of situations managers of multinational firms face. The Fourteenth Edition, now with MyFinanceLab, attempts to capture the rapid evolution of our global marketplace, taking a closer look at the types of organizations that permeate the widespread arena, competition and opportunities in emerging markets, and how financial leadership can integrate the strategic and financial challenges that global businesses face today. This title is available with MyMathLab–an online homework, tutorial, and assessment program designed to work with this text to engage students and improve results. Within its structured environment, students practice what they learn, test their understanding, and pursue a personalized study plan that helps them better absorb course material and understand difficult concepts. Note: You are purchasing a standalone product; MyFinanceLab does not come packaged with this content. MyFinanceLab is not a self-paced technology and should only be purchased when required by an instructor. Students, if interested in purchasing this title with MyMathLab, ask your instructor for the correct package ISBN and Course ID. Instructors, contact your Pearson representative for more information.